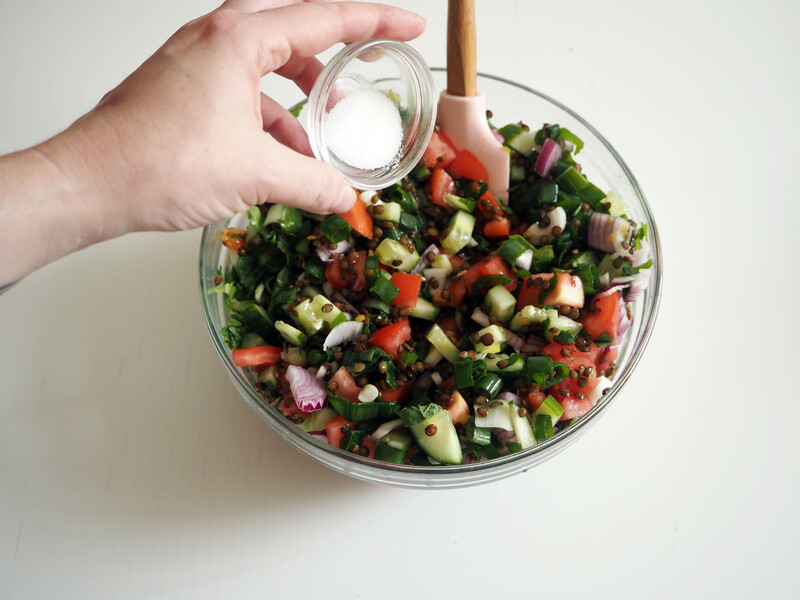 Tabbouleh is a vegetarian salad from Levantine cuisine. 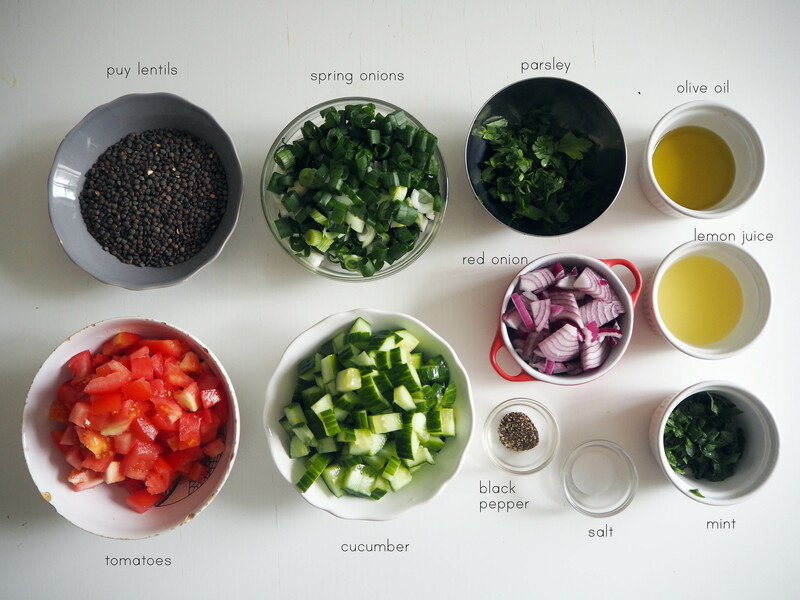 Normally instead of puy lentil in this recipe, bulgur (or sometimes couscous) is used, together with parsley, onion, mint, tomatoes etc. However, even though I like bulgur a lot, I find that it upsets my stomach a lot. Besides, it is not gluten free and so many people who are following a gluten free diet cannot eat the salad when it is made with bulgur. That’s why I started to search for substitutes. 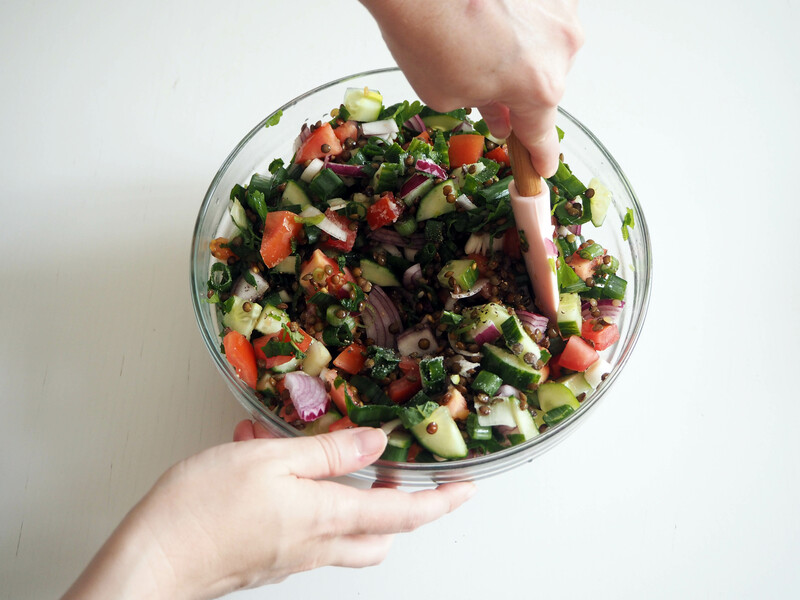 One time I made tabbouleh with quinoa. You can find the recipe here. It was very delicious with quinoa indeed, even though I find quinoa a bit dull most of the time. 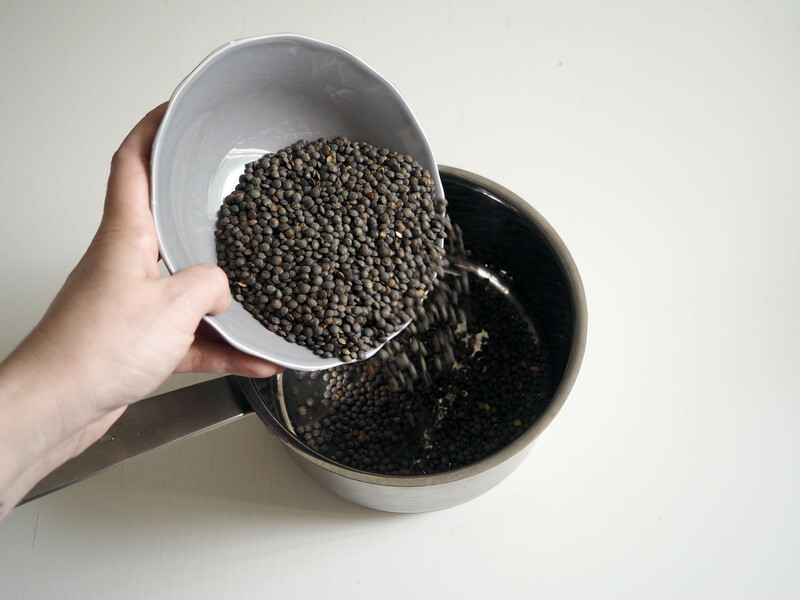 In this version, I am using my favourite legume: puy lentils. I cook puy lentils midly, leaving a little bite to it. 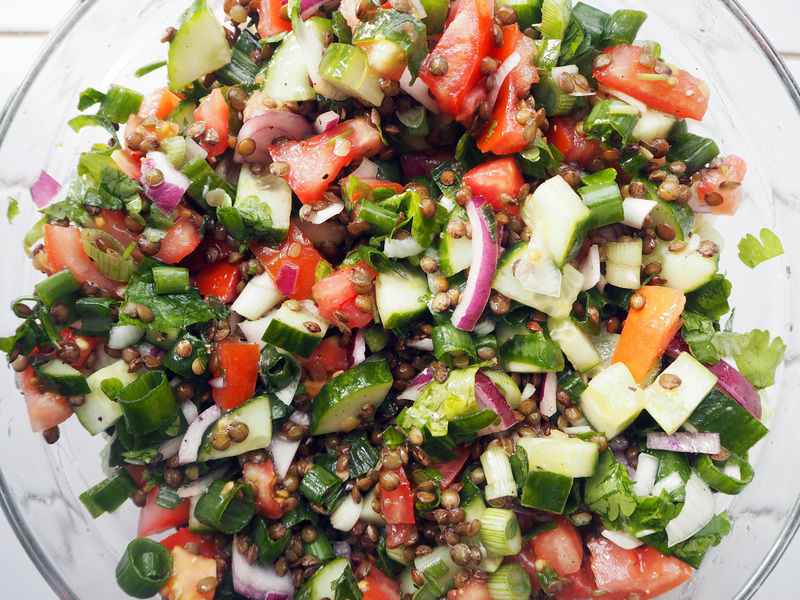 In this salad, using puy lentils cooked this way gives bolder texture. 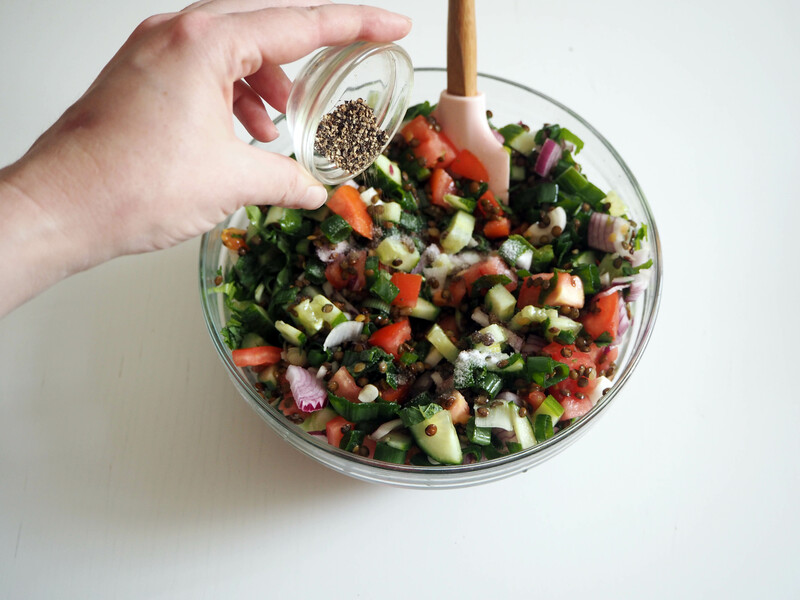 Besides using lentils, I do not use as much parsley as regular tabbouleh. 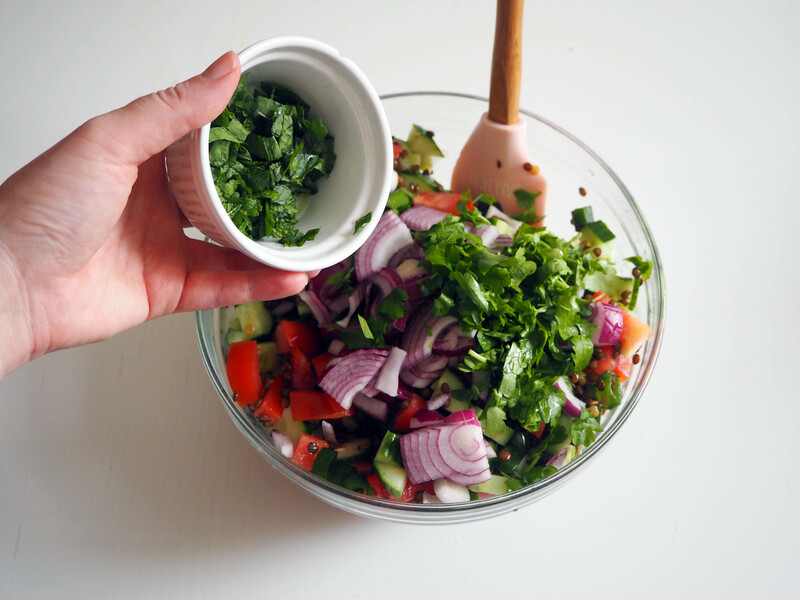 Traditionally, tabbouleh has a LOT of parsley. In this salad though I wanted to balance all the tastes. 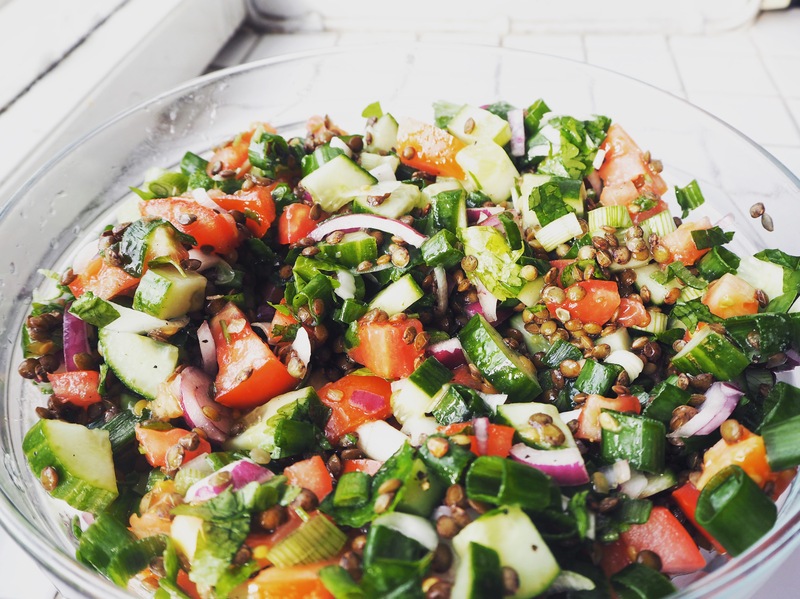 Another change I made for this recipe was to use more fresh mint than my quinoa tabbouleh recipe and adding both spring onions and red onions. 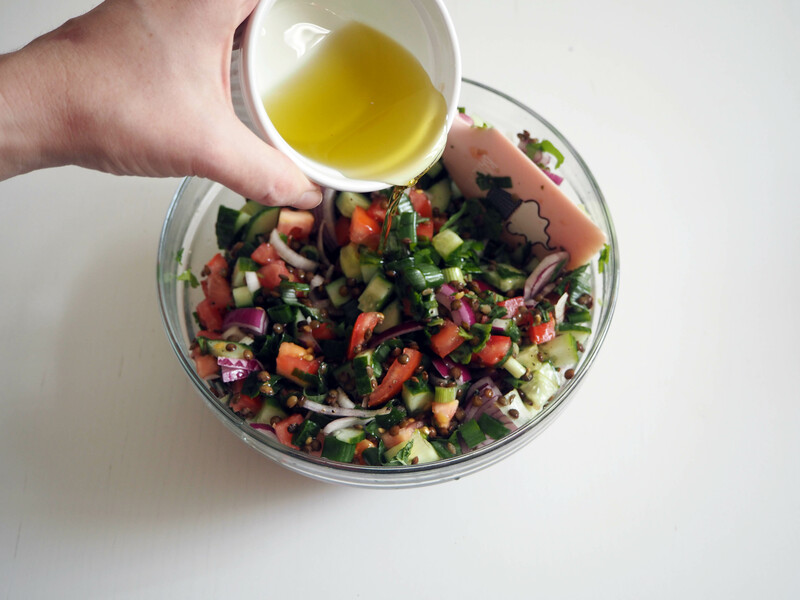 Apart from the salad’s humble dressing which is just olive oil and lemon juice, I poured tiny bit of pomegranate syrup while serving. 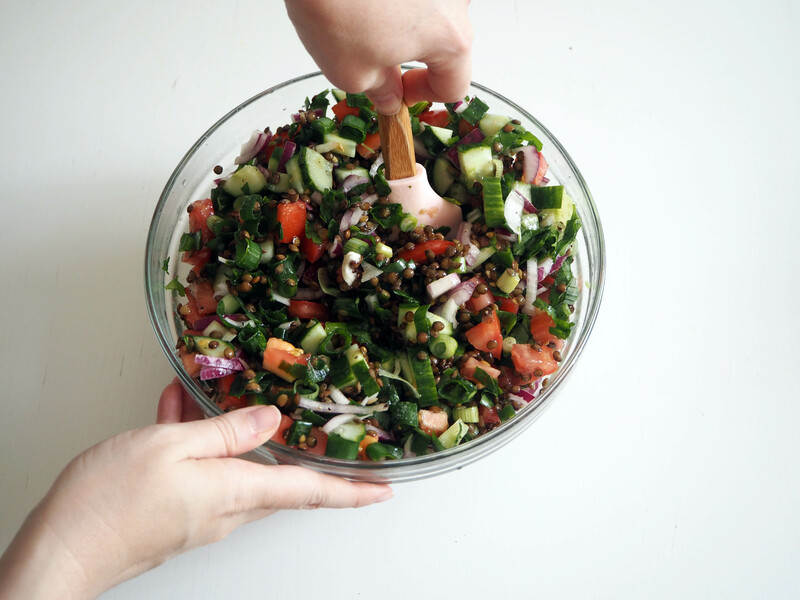 Overall, this salad resembles tabbouleh a lot, but it is not really tabbouleh. Hope you like it! 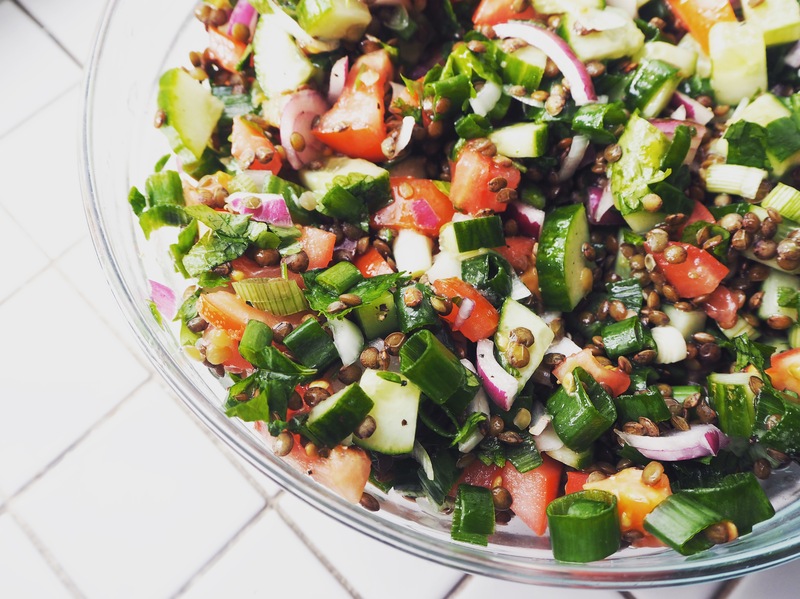 *You can use a bit more lentils if you want to feel them more inside the salad. I’d say up to 3 dl or 1 1/4 cups lentils will be good. In Helsinki, you can buy puy lentils from Deli Deli shop in Hakaniemen Kauppahalli and from Stockmann Herkku (as far as I know..). 1. First cook the lentils. 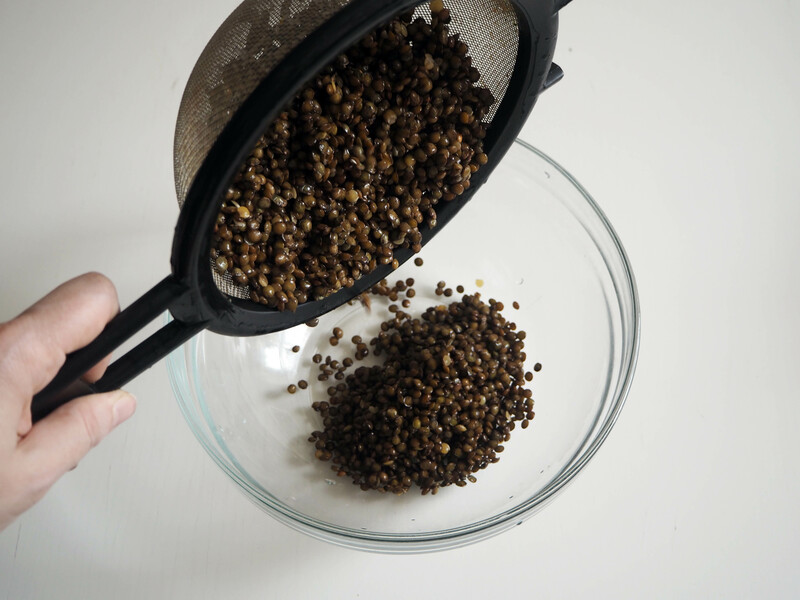 Put the lentils in a pan and add cold water which is twice the amount of lentils. Put on medium high heat. Let it boil. When it boils, cook for about 10 more minutes, or more, depending on how soft you want them cooked. 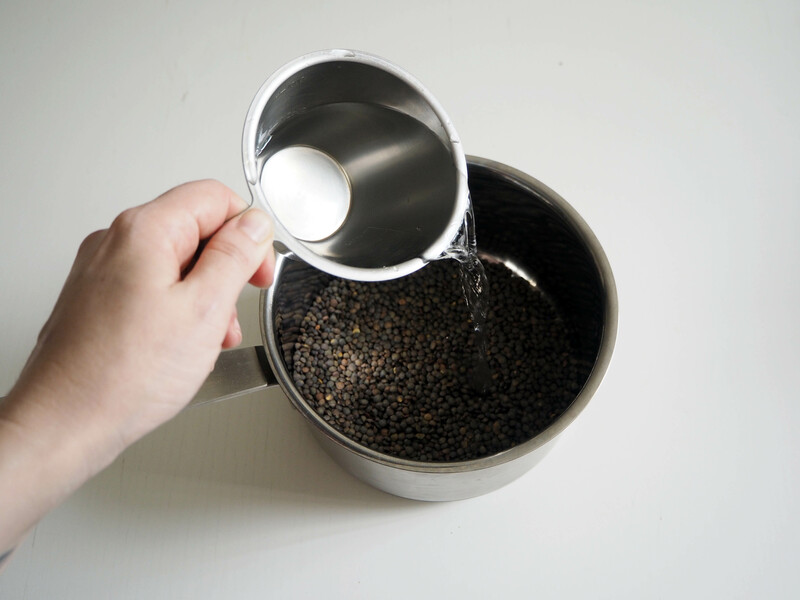 When it is ready, drain the cooked lentils and wash with cold water and let it drain one more time a few minutes. 2. 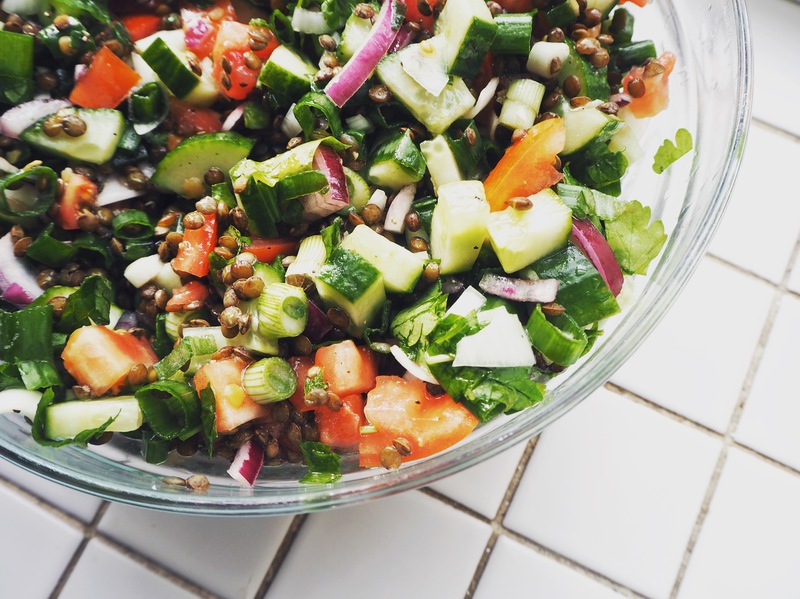 Put the cooked lentils in a big salad bowl. 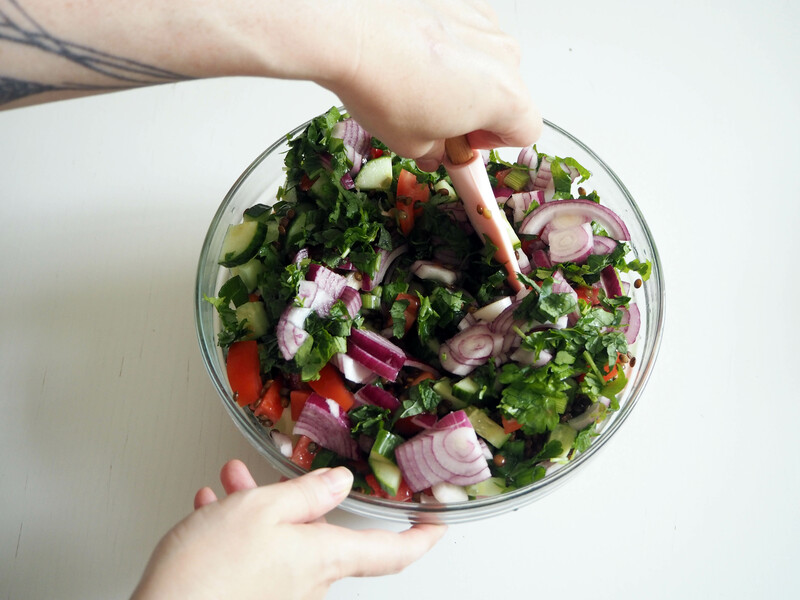 Add all the ingredients up to (and including) fresh mint and give it a good mix. 3. Add some salt and pepper, according to your taste (you may want to adjust it one more time later on so do not put too much right away). Mix again. 4. 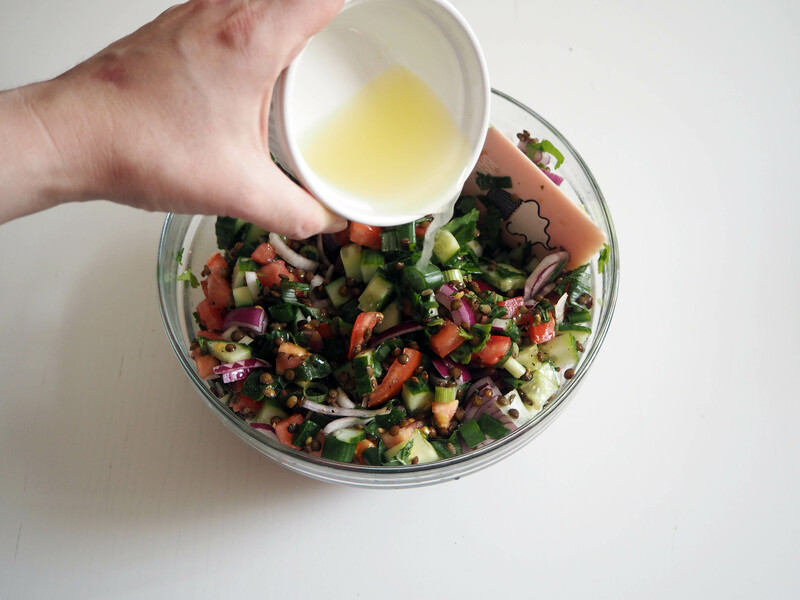 Add lemon juice and olive oil and give it a final mix. Adjust salt and pepper and serve! You may want to drizzle pomegranate syrup if you have some. Enjoy! Great! And yes, it’s very very easy, just a bit of chop chop! Next PostVegan Monday: Roasted Pumpkin Soup With Coconut Milk – Autumn Is Here!